2014 Beijing International Kung Fu Championships! Beijing Shaolin Wushu School is a modern advanced martial arts school that is also authorized and approved by the Education administration to provide education of primary, junior, senior and specialized secondary schools. Opened in 1991, this martial arts academy in Huilongguan (northern Beijing) teaches traditional Chinese Wushu in a 6,000 sqm campus that recruits students from all around China and the world. Students from the Beijing Shaolin Wushu School have taken part in international performances such as Olympic games, World Expo, the Asian Games, and so on. Mr. Fu Biao, vice president of the Chinese Wushu Association, UN Friendly Messenger and the Board Chairman of Global Kungfu Experts Committee is General President and Head Coach of the Beijing Shaolin Wushu School. As a youth he studied in Songshan Shaolin for many years before moving to Beijing and opening his own highly respected, very professional schools. Beijing Shaolin Wushu School also hosts an International Wushu tournament and culture exchange conference annually with teams from all over China and the world, including the U.S., Europe, and Africa. 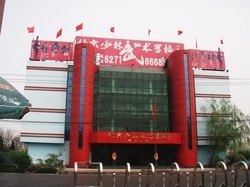 Beijing Shaolin Wushu School has a number of branches in Beijing and Shanghai. Also named Fu Xingzhong, he is a poet, calligrapher, martial artist, teacher, social activist and hugely successful entrepreneur. His list of friends and associates ranges from Secretary General of the U.N. Ban Ki Moon, and former president Clinton to almost every major martial artist in China. In addition to being a premier Shaolin School, it also has a regular school. 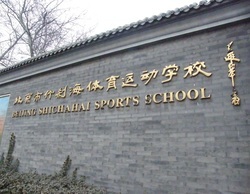 This is THE sports school for China's elite athletes. Shichahai offers a good range of martial arts including: Sanda, Traditional Wushu, MMA, Boxing, and Taekwondo. They also have lots of other sports like Ping Pong, Badminton, and so on. And, not to forget, Li Lian Jie (Jet Li) studied here too. The sports people live and breath their sports. full-time living on campus. But, visitors are welcome and full or part-time training is possible. The campus is very large, and includes a very reasonably priced international hotel (about 450 RMB per night, an out-door track, commercial fitness center and dozens of gyms. The campus is also located adjacent to Ho-Hai lake, one of Beijing's most beautiful and entertaining centers. The best Wu Shu and boxing teachers and trainers from all over China and you can live and train here at the beautiful campus very cheaply. A wide range of styles including Bagua, Tai chi, Sanda, Shaolin and Qigong taught in a picturesque courtyard in Wangfujing. Also one-on-one classes held in Ritan Park. Various days/times. First class RMB 80, second class is free. After the second class, RMB 500 per month. 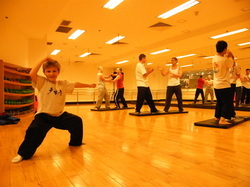 One-on-one classes RMB 150/class. School has been around for about 10 years; they have some 200 students and one class per day. Mostly kids. Small but friendly modern international atmosphere. for all body types and sizes - this style was originally created by a woman. There are two divisions in the Wushu Teaching Department. One is specifically for Chinese students who are trained to become qualified teachers in different styles of Chinese martial arts include Wushu (Taolu), Wushu (Sanshou - Chinese Kick Boxing)n and Tai Chi (Taiji Quan). Another division is specially formed for students worldwide to come to China for professional martial arts training. There is a group of dedicated and high respected teachers, instructors and professors aiming to provide high quality training courses for international students. 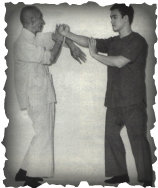 Chinese and English-speaking instructor based in the Wudaokou area offers Shaolin, Taiji, Sanda, and weapons training. Group classes and private classes available. Students can come to the Wudaokou location or request classes to be held at their own location. The Chinese Wushu Association, established in September 1958, is a national non-governmental, nonprofit organization based in Beijing. It is the only legal organization that manages the sport of Wushu (martial arts) on a national scale. 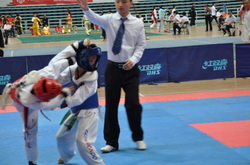 It consists of local martial arts associations in each province, autonomous region and major municipalities in China. It is also a member of the All-China Sports Federation. Right opposite to the Shishahai Sports School.